The south side of Ellis Island is currently a network of abandoned buildings. This part of the island once housed contagious, pregnant and psychotic immigrants. It was home to isolation wards, measles wards, the morgue and an operating ampitheater, all connected by a series of linked passageways. These buildings have been "vacant and deteriorating" for the last 53 years and are in a state of "controlled ruin" like Philadelphia's Eastern State Penitentiary. Ellis Island's south side is now facing a redevelopment. Plans range from creating a bed and breakfast near a measles ward to leaving the buildings in a permanent state of decay. The National Parks Service states that their preferred alternative would be to create an "Ellis Island Institute with Overnight Accommodations." For more information on this redevelopment plan, see The National Park's Development Concepts for Ellis Island. 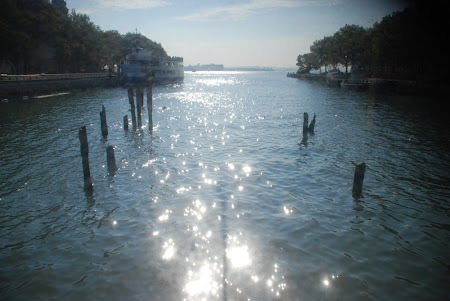 For more photo essays from New York's half-abandoned islands, please visit The Encampment on Roosevelt Island (2007) and Governors Island: Manhattan's Ghost Town (2011). How did you gain access to this space?? I really love your stuff; it combines my two favorite things, photography and urban exploring. yeah, i'm always amazed by your ability to get inside these amazing places to take these amazing photos. hopefully, you've found a way to get in without having to post bail too often. Very nice work, Nathan! Keep it up. I love the one with all the doors. Hey Nathan. Nice work. I also recently finished doing an HDR project of the south side of Ellis Island. It's a great place. Some day, those images will be gone, transformed into its next life. Take care. Awesome pictures! How the hell were you able to gain access? As I understand it, the south part of Ellis Island is off-limits to visitors.